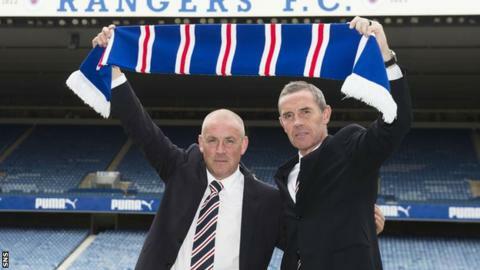 New Rangers manager Mark Warburton has warned fans not to expect "short-term fixes" after becoming the first Englishman to take charge of the club. The 52-year-old former Brentford boss has signed a three-year contract, as has former Gers captain David Weir, who becomes his assistant. "Our aim is to win the division," said Warburton, who promised to play a brand of football that "excites the fans". However, he also said his job was to build "firm foundations" for the club. Warburton succeeds Stuart McCall, who was appointed in March and applied for the role on a permanent basis. McCall guided the club to the Scottish Premiership play-off final, but they were beaten by Motherwell and will remain in the Championship for a second season. One of Warburton's first tasks will be to rebuild a squad depleted by the release of 11 senior players. "I realise it is quite lean," he said. "Our job is to bring suggestions to the table that add value to the club on and off the pitch." He added that he had used "a tight squad of 24 players" at Brentford, guiding them to the Championship play-offs, where they eventually lost in the semi-finals to Middlesbrough. Despite speculation there is no role for former Valencia coach Ian Cathro under Warburton. Rangers director Paul Murray, part of a consortium that took over in March, said the appointments were "the first step in rebuilding the club". What else did Warburton say? He said Rangers will need to develop their youth system and added that the "academy should be the heartbeat of the club". But he stressed that he would have to balance that with the experience needed to guide younger players. Asked what style of play fans should expect from his side, he said there would be no long-ball tactics. "We like players who dominate football, who are comfortable in possession," said Warburton, who has also coached at Watford. The Scottish international, who returns to Ibrox after leaving in 2012 to join Everton, is full of praise for the new boss. "Mark is an experienced manager, he's had lots of different experiences in different walks of life, so I don't think I'll have to tell him too much," said Weir. "I've got complete belief that he's going to be successful." The 45-year-old former defender, who worked with Warburton at Brentford, added: "I think we work well together. "We've got different skills, we've got things we can help each other with. "He's got a business background, he communicates well, he's also a good coach and he's got experience as sporting director as well." As long as he does well, then "no", according to Nigel Spackman, who won the Scottish Premier League and Scottish Cup with Rangers. However he thinks the transition from Brentford, with a ground that holds about 13,000 fans, to Rangers, a club with a global reputation and a ground that has a 51,000 capacity, is a "big ask" for Warburton. "There's a big pressure to get in the Premiership and take on Celtic, but that's going to take a few years and the supporters have to be patient." How did Brentford do under Warburton? The former city trader had already been at the club for two years before succeeding Uwe Rosler in December 2013. He took the Bees from League One to the Championship in 2013-14 - their first time in English football's second tier since 1992-93 - and then guided them to the play-offs. While at the club, he also oversaw the opening of a new academy. The Londoner is also the co-founder of the now defunct NextGen series, a European club competition for under-19s.